I saw this picture in the online version of the Boston Globe and wanted to post it here. Boston is an amazingly historic city, and having the USS Constitution docked right next to the city has always been amazing to me. 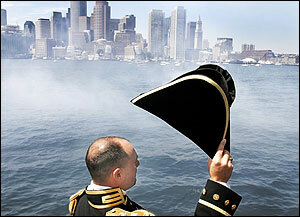 A few times a year they take the Constitution out of its moorings for a trip around Boston Harbor. One year, we were on a ferry and we saw it go by, an unbelievable sight. 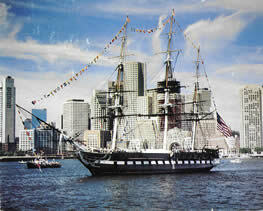 It is fun to have Old Ironsides right where we can see it every time we pass by on our way to Boston. 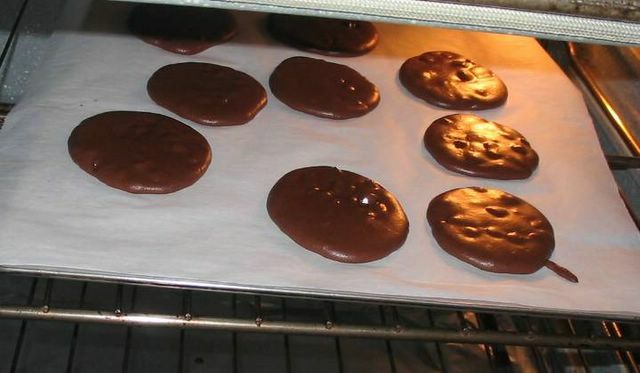 Cookies spreading out like pancakes in the oven. But the cookies turn out great! 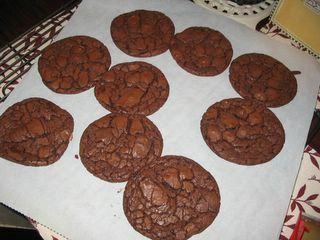 George and I just finished making these triple chocolate cookies from Martha Stewart Living magazine made with milk chocolate chips, chocolate chunks, and cocoa. 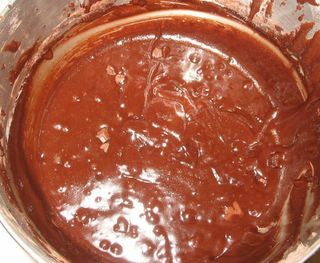 The batter was so chocolately and thin it looked like cake batter. I was worried. The cookies are spooned out with a cookie scoop onto parchment paper. You slide the cookies, parchment and all, to the cooling racks. Lo and behold they are beautiful. 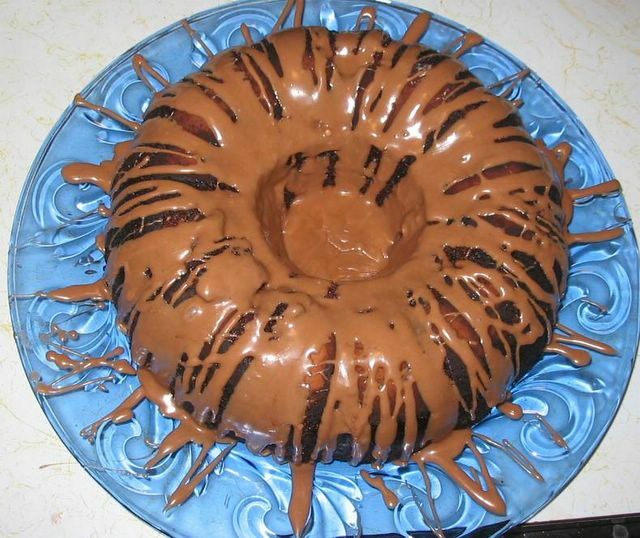 Chocolately, and cracked and shiny on top. A good recipe and the cookies are delicious. A package is on its way to Michael tomorrow morning! Woot! The small box of jello is there for scale. This is one BIG bottle of Tabasco sauce. Yesterday evening George and I had dinner at a place called Fresh Eats, or something like that, a restaurant that makes fresh food into sandwiches and salads. I had the Miami Beach roll up, which was chicken and avacado and red peppers, and George had the Muffalatta, which is a New Orleans sandwich made with ham, cheese and olives, and crushed into a cuban type sandwich. Afterwards we went to BJ's to get Fruit 2-0 for me and we couldn't resist buying this 12 ounce bottle of Tobasco sauce. 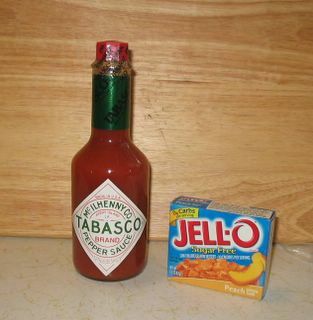 We went to Avery Island, Louisiana a couple of years ago and toured the Tobasco factory and saw them crushing the tiny red peppers into a sauce. The ingredients are simple: vinegar, red pepper and salt. Simple. This company has been making pepper sauce since the Civil War! It is quite a historic company and very interesting to read about. We like Tobasco better than all other hot sauces we have tried. Some people are absolute fanatics about pepper sauce. It is fun adding a splash of red pepper sauce to your eggs in the morning, or to the potato salad, or just about anything but your cereal. Just looking at this big bottle in our kitchen reminds us of the fun we had in Avery Island, Louisiana, where the dew point is high and the weather is almost as hot as the sauce. 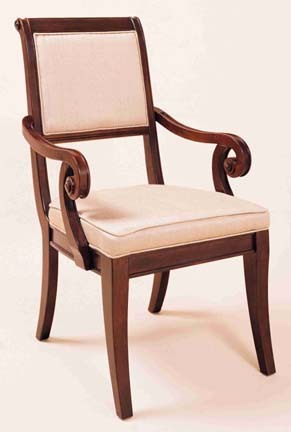 The chair that was in the way this morning. I love it anyway. The table I love dispite its size. Last weekend, the oven stopped working. Yesterday the air conditioner in the den stopped working, and all week, the smoke alarm in the hall has gone off every time someone takes a shower. Oy. All these things are frustrating when both people work and have no time to take care of it all. 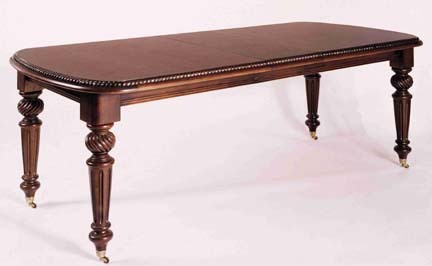 Remember the new dining room table? Well, it is a lovely table, but it actually is too large for the room, and sometimes we get really frustrated trying to get stamps and envelopes out of the drawer that only partly opens because the dining room table is in the way. I have a solution. Move the stamps. I love the table. We know it is too big. I'm trying to ignore that fact and don't want to be reminded, thank you. The weather has cooled down by almost 30 degrees. Yesterday it was so hot in the house when I got home, that I holed up in the den, and even that never got really cool. It is not fun to be running with sweat when you are just sitting there knitting. 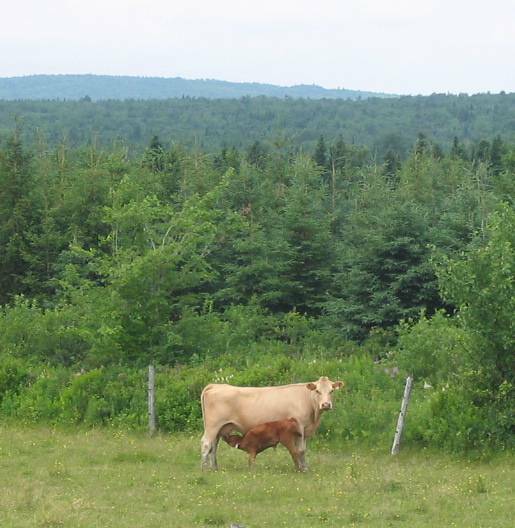 Thank God, today is much much nicer for most of the country. We didn't get a big storm or rain, but we did ge the cool behind it. Things will be fine. If things get too bad, I can always go into the bathroom and count 10 blessings. That always works! Yesterday when I drove up the driveway, I saw that a gust of wind had taken the umbrella, flipped it over and flung it over the railing of the deck onto the drivway, taking the table with it. 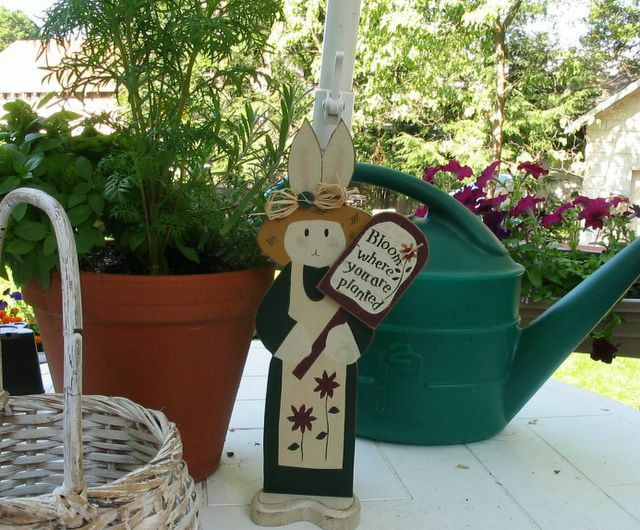 The table legs had fallen off and the watering can had landed upside down in one box of flowers, while another box that overhangs the railing had been knocked off by the table and flipped over upside down on the driveway. It looked like a tornado had come through. I raced through the house and went outside to see what I could do to help. Luckily, the window box of tarragon and geraniums that fell upside down is ok, thanks to their toughness. Any other flower would have been broken into tiny pieces. All is well now. Even the umbrella is ok, although its spokes were all awry and we had some straightening to do. That wind must have been something. Even a bamboo windchime hanging by the kitchen door lost it's clanger and needs to be fixed. From my office I saw that wind kicking up in the middle of the afternoon and it left as soon as it came. 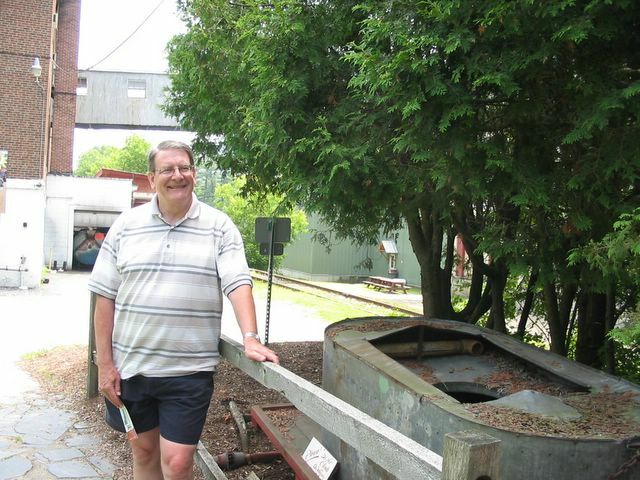 Who knew it was wrecking things on the deck. The picture is of my vinca, which is a flower that my mother likes, which I plant every year, and which always reminds me of her when I look at it. 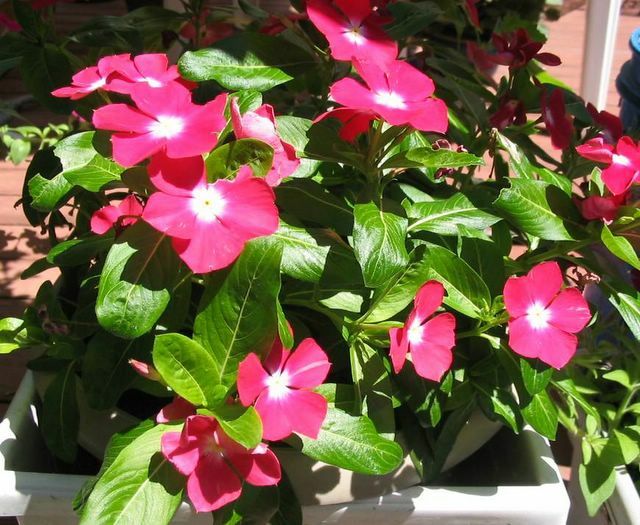 Mom, as you know, is 95 and lives in Oklahoma, where she plants lots of flowers that thrive in full sun. Oklahoma is a very sunny place. When I was down there in the Spring, we went to Lowes, and she had me look for Mexican Heather, another plant that she likes. Last weekend George and I found three hanging plants of Mexican Heather at Home Depot which needed a home, so we have that in the backyard too. He likes it too, and neither of us had known about it before. Summer is here for such a short time. 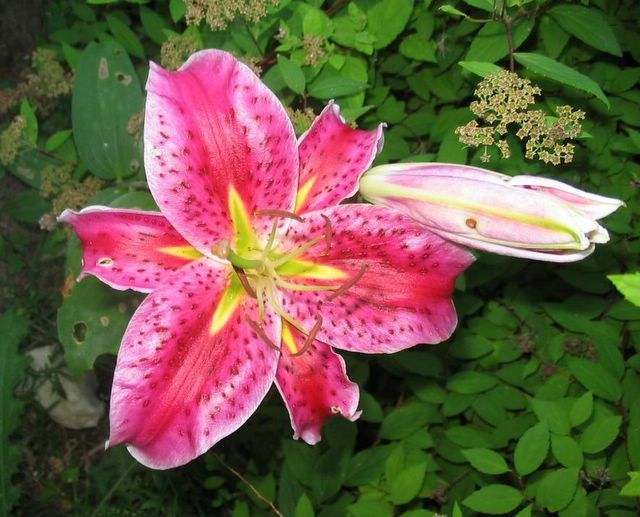 I'm going to enjoy all these flowers and birds now, before it fades to fall. I have learned another lesson about yarn. I know that you are supposed to use the same dye lot on a yarn project. 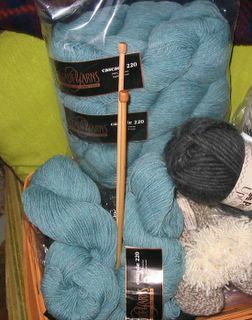 I am using two dye lots because we threw half the yarn away and I had to buy more a year later from the same store. I thought dye lot was because of color. I decided that these two lots were very close in color and I thought I was home free. 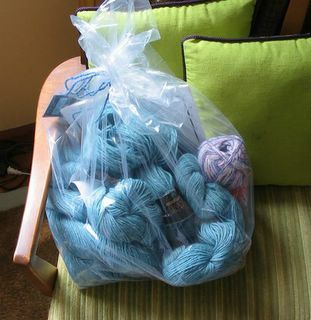 As I told the yarn store owner, "I'm going to let it go", meaning I'm not going to worry. The color is almost exact. However, in knitting the last four inches of the back of the sweater, I have discovered that the bulk, or the weight of the yarn is different. The new dye lot is a bit finer...and although I don't think anyone will notice, to me, working with the yarn through my fingers, there is a big difference. I am going to forge ahead. It is still a pretty yarn, and it is just a sweater for myself. I think it will be fine, though the heavier yarn is more fun to work with, the lighter weight might even make a prettier sweater. Look on the bright side. 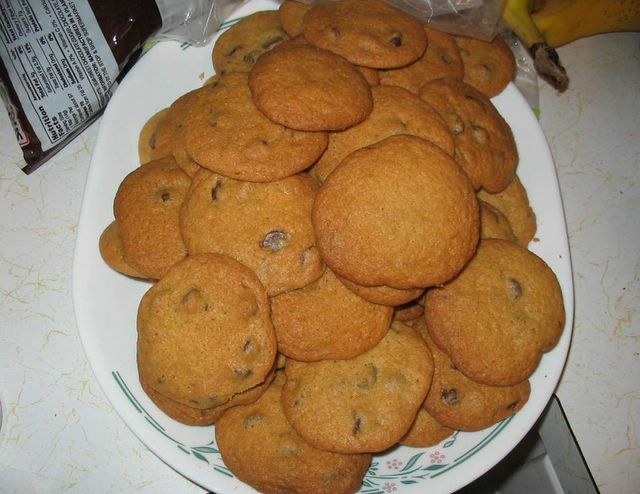 George's homemade chocolate chip cookies. I thought folks needed a lot of chocolate today. George and I were coffee hosts at church today. It was another day of "abundant sunshine" as they say on the weather channel, and not too hot, so we set up the tables outside for coffee hour. We made chocolate bundt cake, lemon bars, and chocolate chip cookies, and we bought three cheese coffee cakes. I made 70 cups of coffee, and threw half of it away. The coffee drinkers must have stayed home today. We also had lemonade and tea, and I think most people had that. Anyway, it was another successful coffee hour. The hard part is cleaning up afterwards and putting the heavy tables away, and when it came time for that, no one was around but us. We took our time, did the dishes, put everything away and left the church at noon. For some reason, I like doing coffee hour and hosting people. I should have been a caterer. But it is hard on the back and I've learned to wear really comfortable shoes. Today I wore a blue and yellow flowered apron that matched my yellow slacks, and several people commented on it. It is a Swedish church and they love their blue and yellow. 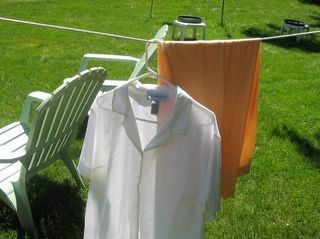 As I walked into the house after church, I was carrying a tray and a thermos cup from Starbucks and the coffee leaked out and dripped all over my new white beaded blouse and yellow slacks, so I had to do an immediate half hour washing in cold water at the kitchen sink, and they are now hanging on a quickly assembled clothes line in the sunshine. If you don't know about Fels Naptha soap, get some. It comes in a bar, is very old fashioned, and takes out all stains without ruining clothes. I could not live without my Fels Naptha soup. Stains gone, crisis averted. Lucikly I did that after church and not before. God is good. Have a great day. The sweater! 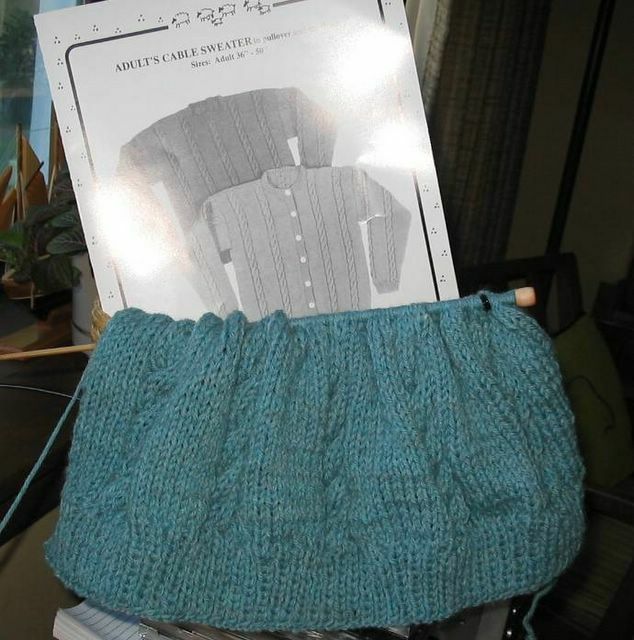 Yankee Knitting pattern for a cable knit sweater. I finally found the knitting project that I want to work on. It is a cable knit sweater for myself. After I finish it, I'm going to make one for George and one for Michael. It is fun to work on, and I have been looking for just the right project that would hold my interest. Everyone has been using the new funky yarns to make scarves, and I made more than my share last winter. They are actually too easy for me, and I really need to refine my skill and learn something with a good project. I'm sure this sweater will be just the thing. We don't have any big plans this weekend. I have some organizing to do with my beading projects and the new beads I bought in Washington, and George might go fly. We have decided to separate for our various errands and projects. No interesting wildlife in the back yard this morning, just assorted squirrels and birds. Back to the sweater and my show on TV about runway fashion that is on every Saturday morning at 8:00. Neither George nor I was going to be happy again until we had replaced the yarn that we threw out by accident the day we left for the cabin. If you remember, this is the story about putting yarn to go to the cabin by the front door, where a small bag of upstairs trash also was, and George thinking, rather naturally, that they were both trash and asking me. I said yes. The yarn went out to the trash truck? Well. 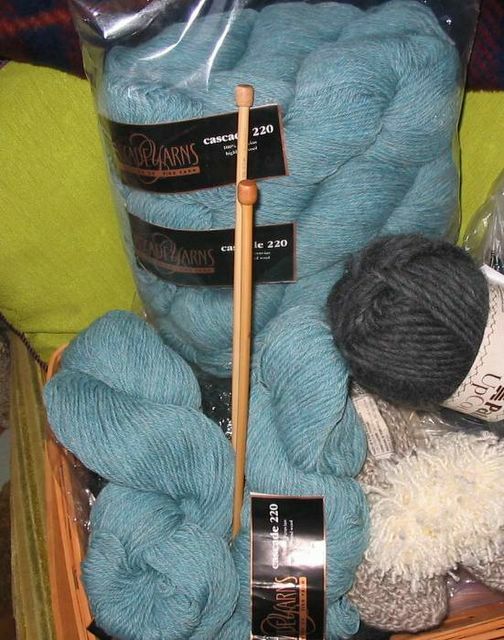 Today I went back to the store and bought more skeins for the sweater I am starting on, another pattern, #5 needles and a cable needle: $66.00 total. I'm thrilled to be back in business with this sweater project and as I said to George, "this is a good way to get it behind us." I met a wonderful lady who owns the store and we talked for an hour and a half today about knitting. We shared our enthusiasm and our knitting war stories--projects gone bad--and had a great time talking! I'm glad we threw out the yarn! Well. Almost. Yesterday Michael gave me an url to download for AOL instant messaging. At the risk of sounding old fashioned, ... wow. This is cool! I enjoy chatting with Michael and this morning we were able to have a really good conversation about Churchill and WWII while I was sipping my coffee. Who knew? Very cool. Today is my first Friday off since my new hours went into effect. For the summer I will be using this time to set up my web site to sell jewelry and also selling some items on Ebay. At an antique store in Vermont, George saw a sign that he thought I should have. It is a wooden figure of a cute rabbit, holding up a sign that says, "Bloom where you're planted". It is especially good for me because I have moved from city to city several times, and because...well, it is just how I like to think. Thanks for pointing that out, George. No turkeys this morning. 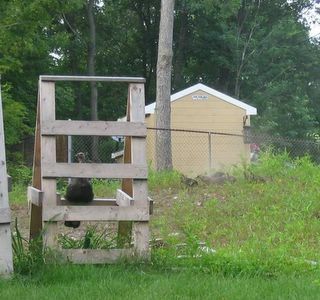 The neighbor is hammering on some boards, so I'm sure that is not inviting. I wonder where 20 turkeys or more are going to go in this neighborhood? Have a great day. Back to instant messaging. When I was writing the blog, the turkeys came back! 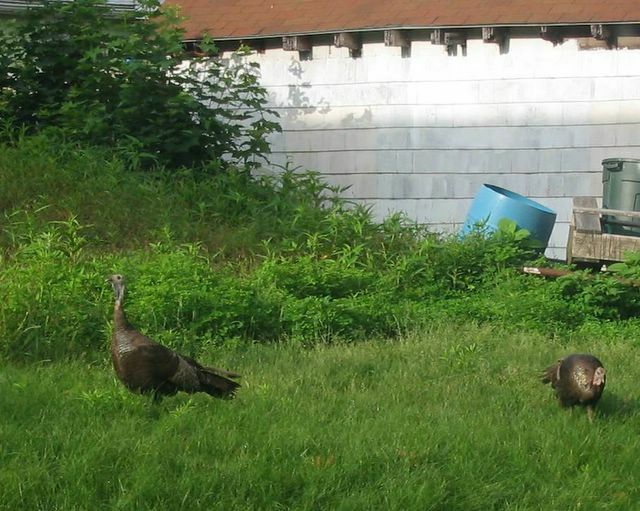 Just visible is a momma turkey taking a dust bath, and the little ones are in the grass. George ran to get a picture but they were moving away. Incredible! This morning, barely awake, George called me to the upstairs bathroom window. 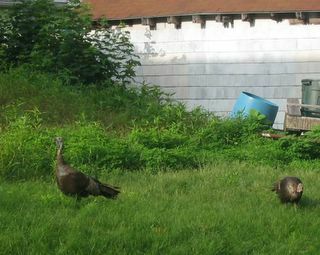 There in the neighbors yard, venturing into our yard were three wild turkeys--big ones--and 16 baby wild turkeys. I could NOT believe my eyes! We have never seen turkeys around here before. 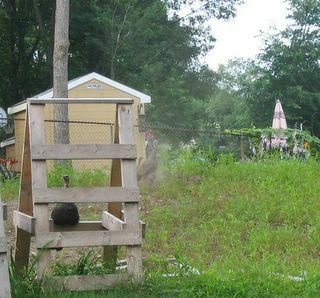 The neighboring house is just being built, and there is a small woods next door to that, and that must be where they live. Incredible! What a sight. 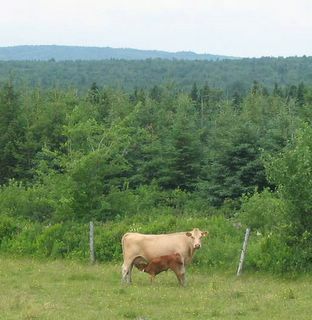 We went out on the deck to take a picture, but they must have caught wind of us, because they ambled off into the woods. 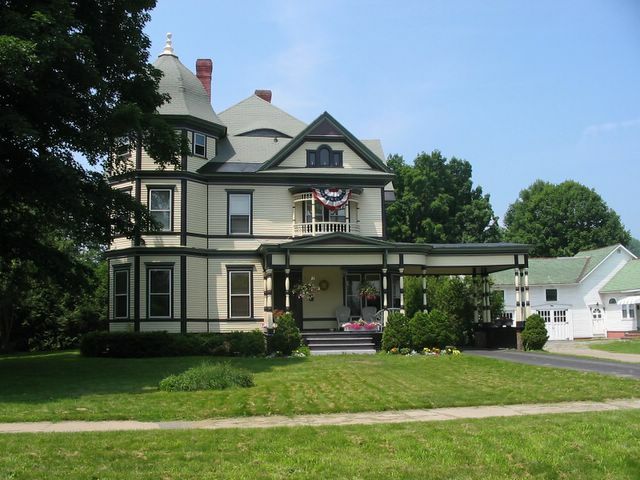 For awhile, they were taking dust baths, and George said that someone large has laid in the orange impatien bed, someone large like a big turkey. 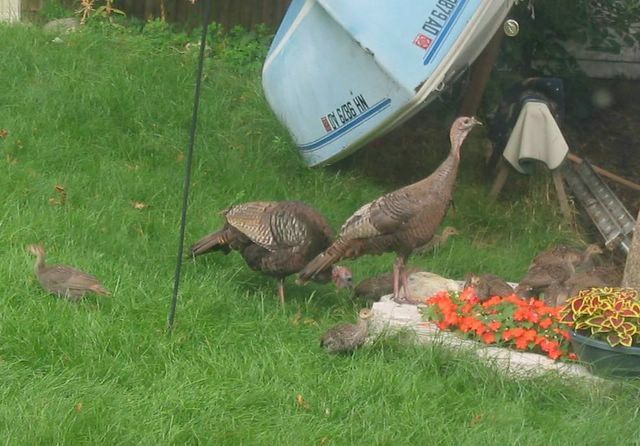 We think they were in our yard early this morning eating the bird seed that has fallen under the feeders, and probably taking a drink in our bird baths, which are very popular indeed. I wouldn't have believed there would be 19 turkeys. 19!! If all 16 babies get big and stay in our neighborhood---the mind boggles. George...get more bird seed!!! Oh my gosh. Have a great day. Gobble gobble. A house on the river in Montpelier, VT.
A New Hampshire farm we passed by. Lets go for a boatride on my birthday! One of the vacation hats: I had five. My birthday cake at the cabin. July 11th. I wasn't the only one with a swollen eye! One of many beautiful streams we visited. Covered bridge, another good fishing spot.